New Scientist recently got in touch with a series of experts to discuss a thought experiment they call Civilization 2.0 – If we had the chance to redesign civilization from the ground up, with all our current knowledge (and the agreement of everyone in the world), how would we do it? They spoke with Geoffrey West (a future SALT speaker) about appropriate size and scale of cities, noting that there seem to be some very predictable patterns to the way life in cities changes as they grow. Apparently many things increase at a steady 15% with each doubling in population of city: energy and resource efficiency, income, wealth, colleges, but also crime, disease and even average walking speed. In talking to Christopher Flavin and Mark Delucchi, they come to the conclusion that denser, transit-oriented cities (rather than sprawling suburbs) will be important. 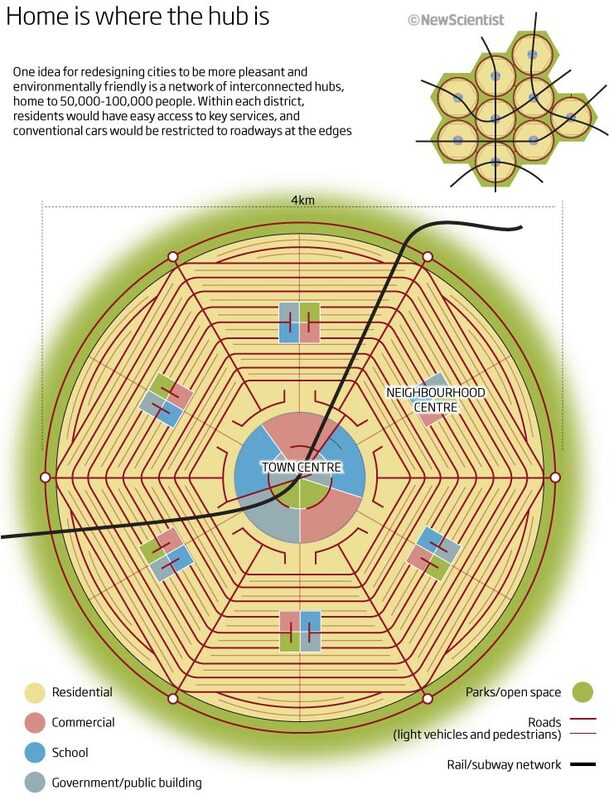 A combination of top-down planning would establish hubs near fresh water and other useful resources, link them into a large-scale transit system, and then hand over the local design and details to residents. Carlo Ratti is particularly keen on this local-scale wiki-style planning and hopes that in Civilization 2.0, residents will have much more knowledge and influence, thanks to technology, over the planning decisions immediately affecting them. This local/distributed paradigm also informs their approach to energy – Lena Hansen encourages a locally-producing renewable system for the sake of resilience and efficiency. Then they zoom out a little more and discuss ways that the cost of producing energy could be factored more realistically into the costs of materials and goods and ways that environmental quality and human happiness could better be accounted for in measures of economic well-being. For governing our new, enlightened civilization, two sides are explored. The first perspective comes from sociologist Robin Dunbar, whose research has shown the upper cognitive limits of the human mind to know and recognize other people. Each person, he’s found, can only recall personal information and maintain a relationship with about 150 other people. Groups adhering to this limit can generally be governed through personal relationships rather than hierarchy and bureaucracy. Paul Raskin takes a different approach: he proposes a newspaper published once per decade and suggests that the most recent edition’s headline would have to be about what he calls the ‘planetary phase’ of history. He hints at what some have called the ‘anthropocene,’ a geological epoch in which humanity is the major force in earth’s biosphere. Such broad, global effects, he explains, require broad, global control – not necessarily a single world government, but certain goals and values set and enforced on a planetary scale. In the end, the article also explains that too specific or rigid a design opens civilization up to catastrophe in the face of climatic and ecological change. Historically, we’ve seen societies that run very efficiently in their given environment unable to adapt to changes to that environment and so some flexibility at the cost of efficiency will likely be, in the long-run, worth it. The full article on New Scientist is available for the next week (if you are willing to go through the free registration), after which it will require a paying subscription. Above, you can find links to information on many of the experts they spoke with as well as the points each contributed to the scenario. Happy planning!